It’s no wonder an increasing amount of businesses large and small have invested time and money into creating blogs. Whether you’re wondering how to be a leader instead of a boss, or how to deal with angry customers, where do you go? The internet. 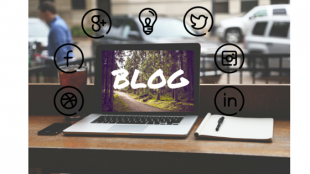 Blogs have been garnering popularity due to their succinct, creative ways of imparting information, whether it is through infographics or “Top 10” lists. Having a blog increases traffic to your website. The posts can act as references for prospective viewers and buyers. When the content is really really good, you want to make sure that your audience would want to print it out immediately and hang in on their wall, or at least forward it to the rest of the office. When the information on your blog is valuable, readers will continue to come back, and your blog will end up promoting itself when others share the content with the world. So before clicking “Post,” make sure that the content has value for your audience. A blog reflects your business’s personality and makes it stand out. A blog sets your business apart from all the rest of the tech startups, boutiques, and businesses in the area by providing an easily accessible platform for your voice. Professional and straightforward? Customer-service oriented and quirky? Attentive to pop-culture and creative? The design and content of your blog can reveal anything you want to prospective buyers about how your company operates and what it might be like to work with you. Blogs allow for wide-ranging visual content. Posts on a blog allow for variety in content. Instead of simply uploading pictures, text, and traditional articles, blog posts can be an infographics, video, chart, list, or a stellar haiku if you’re feeling especially creative. The freedom a blog provides allows for more attractive, varied content for your readers to scroll through. Additionally, readers are able to search the blog for specific material they are looking for through tags, and are able browse “How-To” articles or infographics exclusively if they so desire. Need ideas? Check out some of the lovely OpenSesame approved blogs below or one of the numerous courses on all things business & blog related on OpenSesame.